The astronomic increase in the price of Bitcoin in recent times has brought cryptocurrencies to the mainstream and lured many into investing significant chunks of their hard earned money in the digital currency, in spite of repeated warnings from central banks and Wall Street veterans. In fact, with Bitcoin already going through the roof, many investors are looking for more ‘value-for-money’ alternatives, which is why Ethereum, IOTA, Litecoin and other ‘altcoins’ have also seen an exponential rise this year. However, with more and more people trying to cash in on what can only be described as the 21st-century gold rush, con artists are also getting in on the act trying to make a fast buck by duping uninformed investors. One such case came to light recently, when Delhi Police’s crime branch arrested a 32-year man from Rithala called Narender, for allegedly duping people by luring them into investing in a fictional cryptocurrency called ‘Kashhcoin’. According to the police, Narendar also goes by Sonu Dahiya and, is said to be a resident of Sonipat, Haryana. Raids have also been conducted in Maharashtra, Rajasthan and Uttar Pradesh, and more arrests are likely in the coming days. Explaining the modus operandi of the gang, the Joint commissioner (crime) of Delhi Police, Alok Kumar, said that the gang used a combination of new-age technology and age-old pyramid scheme to make money. The gang made around Rs. 50 crores ($7.8 million) by duping thousands of unsuspecting buyers before one of the victims called up the police to complain about the activities of the company. 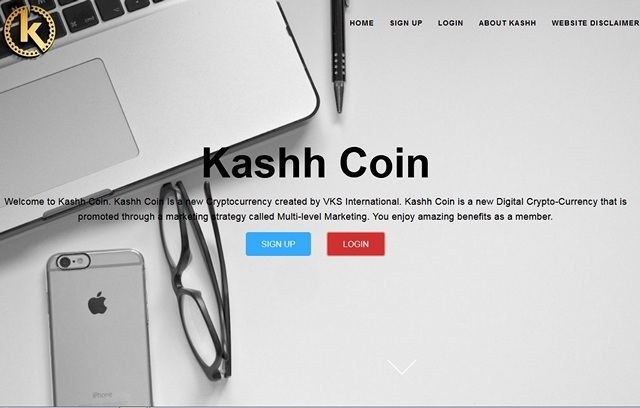 For some reason, the website in question, ‘kashhcoin.net’, was still accessible at press time, but we will advise our readers to exercise caution while accessing it. According to DCP (crime) Bhisham Singh, “To lure investors, they organized seminars in several cities and called eminent personalities to impress people. These seminars saw huge turnouts. Videos of these seminars were then uploaded on YouTube and social media sites. Details of those attending these events are being verified”. A Bhojpuri actor and a Bollywood actress are also said to be among the people who endorsed Kashhcoin, although, it isn’t immediately clear whether they are also under investigation for complicity or worse.